Just over sixty miles from London Heathrow, the Cotswolds are a range of limestone hills and one of the most visited regions in Britain. Known for its beauty, it was designated an Area of Outstanding Natural Beauty (AONB) in 1966, there are numerous pristine thatched, gold or silver grey stone cottages which draw visitors from all over the world. Built in part many years ago by merchants from the wool trade the villages now include beautiful hotels and ancient inns. An area favoured by second home owners including David Cameron and a number of other prominent celebrities, it has also been used by the makers of the television series Downtown Abbey. Very busy in the summer, the best time to visit is during the spring or autumn. 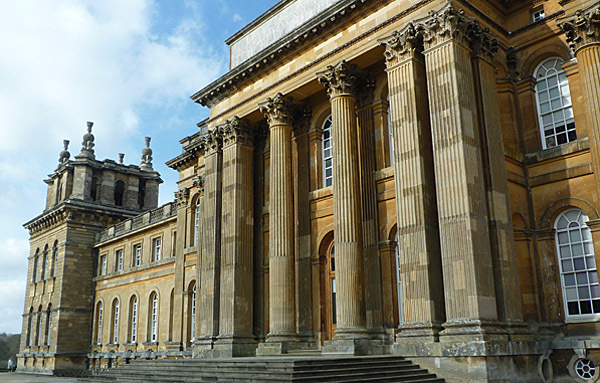 As well as the many delightful villages and towns in the area there are also plenty of major attractions including Blenheim Palace the birthplace of Sir Winston Churchill. This is just a short drive from the town of Witney. A huge site, there is lots to see and do. Bordering onto the estate is the town of Woodstock with its quaint shops and delightful eating places; it is an ideal place to stop by when visiting the Palace. Churchill is buried nearby in Bladon. 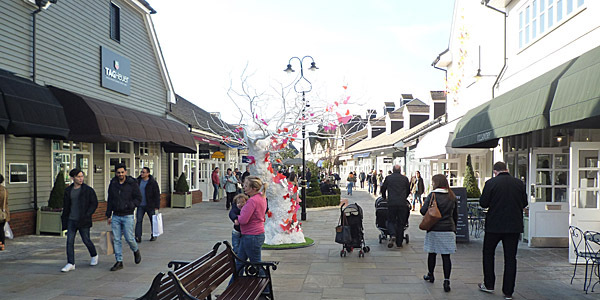 If you are into shopping, you should make for Bicester Village a few miles away which is a designer outlet. Here you will find names such as Prada and Gucci all at discount prices. Oxford is another major draw with its university, delightful river walks and shops. Many of the colleges are open to the public and guided tours can be arranged. Visitors also enjoy punting (a punt is a flat bottomed boat) along the River Thames or the Cherwell. Other smaller towns include Broadway and Burford which both have a range of antique shops and places to eat. Other towns worth visiting include Moreton in Marsh with its famous market, Chipping Campden and Bourton on the Water known as the little Venice of the Cotswolds. One village which shouldn’t be missed is Bibury. Very popular with tourists, it is best to arrive early in the day before the crowds. Not far away is the town of Tetbury, close to Highgrove House which is the home of Prince Charles. Tetbury has a shop where you can buy products linked to the Princes Trust. There are plenty of walks and also cycle trails in the area. The River Windrush is particularly popular as is the Cotswold Way which runs for one hundred miles as far as the city of Bath in the south west of the region. 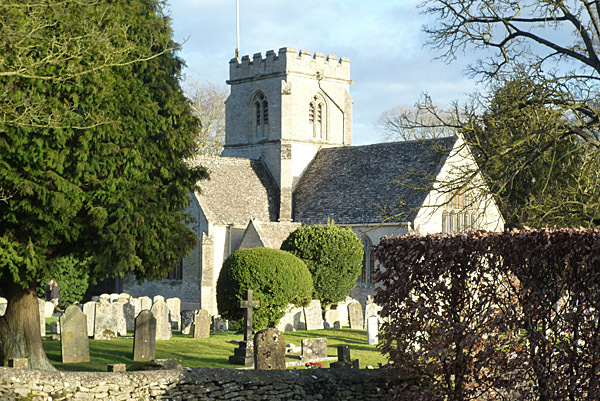 The villages of Bampton, Swinbrook and Shilton have all been used as locations for Downtown Abbey. There are a huge number of places to stay in the region with larger villages usually supporting an inn or hotel. One of the most picturesque is the Old Swan and Minster Mill at Old Minster on the River Windrush. Over 600 years old, the rooms in the main part ooze history and charm. Creaky floors, low beams, stories of ghosts in the local ruins and roaring log fires all add to the magic. Also look out for their Archimedes Screw which is a new way of producing energy from the river. 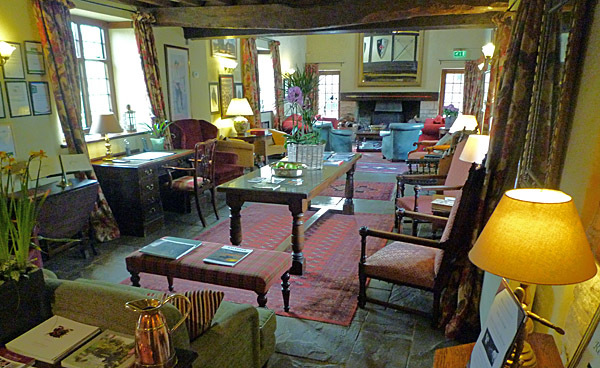 Another hotel which is ideally located is The Bear at Woodstock. 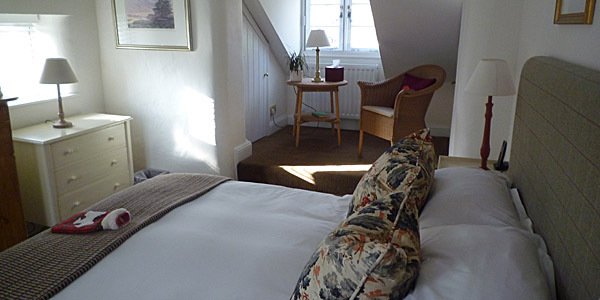 Within walking distance of Blenheim Palace, it has comfortable rooms and is located in the centre of this delightful town. The city of Oxford is also a good place to try as there are lots of cheaper bed and breakfast hotels and guest houses. The city is within easy reach of the Cotswolds and not far from London and there are plenty of tours into the Cotswolds from Oxford. For the more adventurous there are award winning self contained cottages in the area which are ideal should you decide to hire a car which is a great way to explore this region. This part of England is famous for its local produce and there are plenty of dishes worth trying. Cotswold lamb is famous for its flavour and the local eggs are quite delicious. When I was there recently some restaurants were featuring British pies. 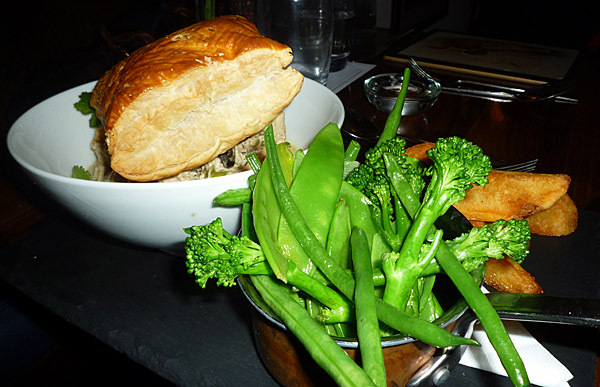 I sampled a delicious chicken and guinea fowl pie. Others included steak and kidney or steak and ale. The area is also well known for its cheeses including a local soft brie, single Gloucester and a range of goat’s cheeses from the Windrush Valley. A meat that is often on local menus is Gloucester Old Spot which is rich and flavoursome. Produced from an ancient variety of pig, it is very tasty and is often served as part of a traditional English Sunday lunch .This includes vegetables, roast potatoes and sometimes a Yorkshire pudding which is made from flour, eggs and milk. Traditionally this meal was eaten by families at Sunday lunchtime and although it is less popular than it used to be many hotels and restaurants still follow the tradition. Other roast meats include beef, lamb, or chicken. For those who like more adventurous fare there are local venison, boar, trout and salmon. Sausages are also popular and are often flavoured with herbs, apples or leeks. Desserts may include Banbury cake or sticky toffee pudding with lashings of custard. Banbury cakes are made from spiced currants but can also include mixed peel, brown sugar and nutmeg. Similar to an Eccles cake these are only made in the town of Banbury using a secret recipe dating back to the 16th century. It is said that they were first made by Edward Welchman. They are also often eaten with afternoon tea. Afternoon tea is very popular and usually includes sandwiches, scones and cream, cakes and of course a pot of tea. There are lots of local beers on offer and in some areas ciders. Breakfasts will often have freshly collected chicken or duck eggs, locally produced bacon and sausages together with home made bread and honey. Great places to eat include the Old Swan at Old Minster, the Natural Bread Company for lunchtime snacks in Woodstock, the Lamb Inn at Burford and the Grand Café Villandry at Bicester Village. Being a rural part of the country, nightlife can be somewhat limited however there is plenty going on in the city of Oxford which has a large student population. The club scene in the city includes Angels, Raul’s Cocktail Bar and the amazing Catweazle Club. For comedy acts you should try the Glee Club. The universities also often put on events so you should tune to the local radio stations or check in the local newspapers for announcements. Outside Oxford most of the entertainment centres on the village pubs and halls and so it is worth looking at local notices and adverts. You may if you are lucky come across Morris dancing or even some skittle alleys including the one at The Swan at Southrop in Gloucestershire. Often you will find local musicians in village pubs providing entertainment. For those interested in classical music there are a number of venues in Oxford including several of the colleges and also at the Town Hall. Cheltenham which is known for its music, hosts a number of events during the year including an international jazz festival. The Cotswolds is around sixty miles from London Heathrow and 100 miles from Gatwick Airport and also close by is Birmingham’s own international airport. There are excellent train and coach links to the area with stations in Oxford, Cheltenham and some of the smaller towns. There are express coach services from London and other cities in the United Kingdom. The area is served by the M40 which links it to London and also by the A40 and A34. Stratford on Avon, the home of William Shakespeare is close by and the World Heritage Georgian city of Bath is within easy reach. Further details can be obtained from www.oxfordshirecotswolds.org. How To Get There: As noted by the author, the Cotswolds is located sixty miles from London Heathrow Airport and 100 miles from London Gatwick Airport, and there are several daily nonstops from the U.S. The other London airports, Stansted (STN), Luton (LTN), London City (LCY) and Southend (SEN) are primarily served by budget airlines, which can potentially save you money to other parts of Europe. The author provided several options to get to the Cotswolds, and more detailed information, including timetables, are available here. Best Time To Visit: The cheapest time for airfare and hotels to England is from autumn to spring. Like the rest of the U.K. and Europe, summer is high season (and also a busy time for the Cotswolds), so airfare and hotel rates will be higher, up to double the other seasons in some cases.